A chronic pulmonary obstructive disease CPOD with Immunologically positive case had responded well to Dr.Mrs.C.Sundari Semparuthi’s treatment. She presents a detailed case history here. Dr.Sundari, a Madurai based Homoeopathic graduate practicing since ten years is a good clinician and researcher. A long term infection caused by an acid fast bacillus “Mycobacterium Tuberculi” Exposure by breathing in or eating infected droplets and it usually affects the lungs although infection of other organ systems by other ways of getting the disease occurs. The lung tissues react to the bacterium by making protective cells that surround the disease organism forming small group of cells or bumps (Tubercles). Untreated, the tubercles enlarge and merge to form large tubercles that undergo a change into a grainy mass of tissue (caseation). Eventually the separated dead tissue ends up in the cavities of lungs. Ig A and Ig M are analyzed together to detect reactivation cases in chronic infection Ig G antibodies give an evaluation of the activity of the disease. Ig M antibodies are an indication of the beginning of a primary infection. 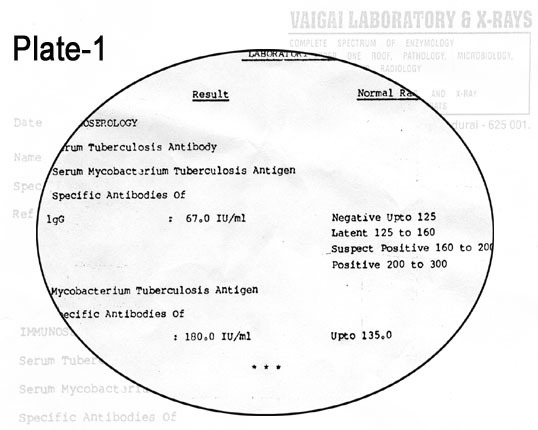 This Ig M test is particularly useful as a diagnostic tool for the early detection of tuberculosis infection. 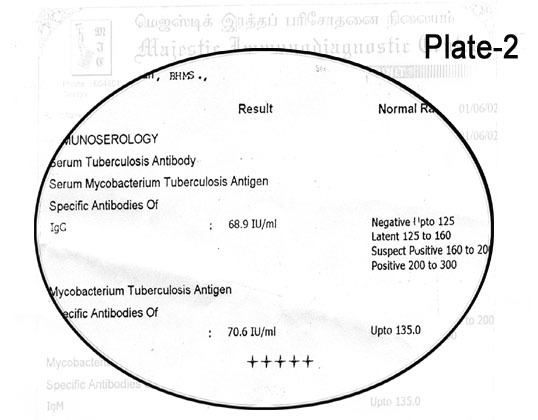 pulmonary tuberculosis and received Anti tunberculosis treatment. Had typhoid fever 2 years back and suffered with Amoebiasis on and off. He is the eldest; 3 sisters got married; Mother died when he was young. His stepmother looked after them well. Father died at the age of 60 due to Ca secondaries .One of his sisters is asthmatic. Sycosis: Untreated or maltreated leading to caseation. Tubercular: Healing by Fibrosis, or Miliary tuberculosis. 30.1.02 Cough + Mild in the morning with greenish expectoration. Patient was explained about his illness and the limitation of the treatment Advised nutritious diet, high protein diet, advised to do breathing exercises & walking.